And they have some interesting price differences that you may view on the product page. This set is a popular, one of the better selling products on Amazon.com with a rating of 4.1/5 stars out of 314 customers on the day of this review. 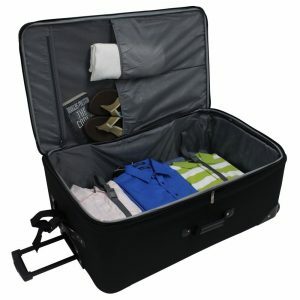 In the package, you will get vertical rolling suitcases of three different sizes and a travel tote. The material used is the 1200D two-tone polyester with PVC on the front part and have the full imprinted lining. They are well made and durable bags that were reported to hold up well over many travels by different customers. You can check in the smallest suitcase or the tote that includes an adjustable shoulder strap with rubber padding. Each suitcase includes two wheels that are not the spinner type but maneuver easily and appear to be solid and functional. They all have the interior retractable telescoping push-button handles as well as the dual side and top handles. They are pretty spacious inside as well with zippered mesh lid pocket and elastic tie straps for better organization. You have several front pockets for items you want to access easily at the airport and an ID window at the rear panel. And the travel tote has a large main compartment with a top center zipper opening. The smallest travel tote weighs 2 pounds and measures 15 x 11 x 6 inches. The small cabin bag weighs 7.7 pounds with the measurements of 21 x 13.5 x 7.5 inches with the ability to expand it with another 2.5 inches. The medium size suitcase weighs 8.5 pounds and measures 25 x 15 x 9 inches (11” deep as expanded) and needs to be checked in before your flight. And the largest one has the weight of 9.5 pounds with the dimensions of 29 x 17 x 10 inches (12” deep when expanded). So you’re getting about an extra 25% on each suitcase for packing in more stuff. All four of them are nested inside each other for easier shipping and storage. 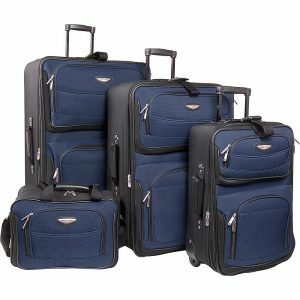 The Traveler’s Choice Amsterdam Luggage Set is offered with a five-year limited warranty for any defects in material and workmanship. This is a set of four nice looking, modern, lightweight, durable and spacious bags at an affordable price. And if you do not have very high expectations they should do the job for your business or leisure travels. This set is not the best of the best but for the lower price point concerned for a set 4 bags, you’re getting pretty decent value.